WKU Libraries welcomed former and current students, faculty, staff and friends to an open house during Homecoming weekend. The reception was held in the newly renovated Commons at Cravens, Fourth Floor. 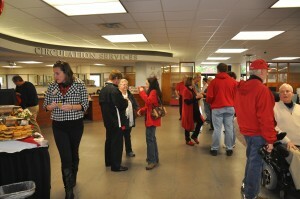 Visitors enjoyed light refreshments, watched a PowerPoint displaying numerous images of Homecoming memories from past decades, and toured the Libraries.